First, the ability to call and text from ONE number across multiple devices. This means that you can use any browser, another phone, tablet, or smart watch to call out, answer calls, and send and receive text messages from your normal number. So if you forget your phone at home, and you're already an hour away, just use that old phone you have at your office, or your laptop to manage your normal communications. A cool feature included in this approach is that all of your call history, text messages, contacts, and voicemails are available on any of these devices. Second, the ability to call and text from multiple numbers on one device. I know a disturbing number of people who carry around two phones; one for business, and one for personal. Sometimes it's due to a company policy, while it's often due to a personal desire to keep work and home separate. In other words, they can turn their work phone off when at home, and not be disturbed with calls and messages. T-Mobile Digits allows you to have different phone numbers all managed on the same phone. It provides the capability to visually identify the difference between calls and messages associated with different phone numbers, while also the ability to toggle on and off a given phone number. Think about the convenience of not having to manage carrying around, charging, and generally maintaining multiple phones! Note that all of this works simultaneously on any device that you enable with your Digits identity, meaning that all authorized devices will ring at the same time. How does T-Mobile Digits work? This is really a paradigm shift in how we think about phone numbers. Historically, our number is our identity, and that identity is assigned to a particular phone or device. With T-Mobile Digits, your identity is no longer tied to a phone number, but tied to YOU. So really, you're then authenticating your identity on any device you want for access to a particular phone number, and no longer shackled to a particular device. It's so logical, it's crazy that this didn't happened earlier! T-Mobile describes that they built an entirely new identity management platform to manage this new method of identification and routing of calls and messages. How is this different from services like Google Voice? Google Voice, Hangouts, Skype, iMessage, and a myriad of other similar services have been around for a long time; so how is T-Mobile Digits different? Personally, I've been using Google Voice for a LONG time. It allows me to have my work and personal phone numbers on one device. I can also login to different devices to use my Google Voice number. The difference with Digits is that it offers true carrier grade calling. These other services are VoIP services, which utilize your Internet connection. T-Mobile Digits on the other hand, uses VoLTE (Voice over LTE) to make calls over carrier towers (not your Internet connection), which results in higher quality (HD voice), and a more consistent and reliable experience. Moreover, it's fully integrated into your device, such that you can enable and disable access to different phone numbers. For me, with Google Voice, I can logout of the service to disable it, however, I can't disable the number that's tied to the phone (i.e. the non-Google Voice number), nor can I have more than these two numbers available on one device. In addition, the phone number that's native to the phone I'm using (i.e. not the Google Voice number) can't be disabled. So while it has offered me more flexibility, it doesn't have the same feature set or flexibility as does T-Mobile Digits. Most companies issue employees a company cell phone and phone number. This is certainly costly and has operational overhead. Consider that with T-Mobile Digits, a company can choose to issue you a phone number only. You then use that phone number on any device you already have! When the employee leaves the company, the phone number remains with the company, including any contacts associated with it. Multiple people can also access the same number, allowing a team of people to field calls from clients, or for support. I'm not clear as to how this actually works in practice though. For example, what happens if two or three people answer the call at the same time? Interestingly, you don't even have to be a T-Mobile customers to take advantage of Digits. You can be on any carrier (ex. Verizon, AT&T, Sprint, Boost Mobile, Cricket, TracFone, etc. ), and still use the Digits app to access these features. Note that if you use specific T-Mobile phones, you'll get a fully integrated experience, rather than having to use an app, however, this approach provides infinite flexibility to use and deploy this service on any phone, and on any carrier. At launch the Galaxy S6 and S7 series, and Galaxy Note 5 had Digits already integrated. As VoIP technologies continue to improve, it's arguable that T-Mobile Digits won't be as compelling, or even become irrelevant. That would be a fair comment, however, in my opinion, T-Mobile has a unique, first-to-market feature that will be years before other carriers can copy it, or VoIP becomes as good or as flexible. Until that happens, it's a great feature for a lot of us who need multiple phone numbers, but don't want the hassle of managing multiple phones! You can even assign temporary numbers that you can give out to certain people that you don't want to have your main number, while still having it fully integrated into any device of your choice. I see this as a pretty innovative service that will get T-Mobile additional attention, as well as additional customers. It may be an irrelevant feature for a lot of people, while invaluable for others. I'm looking forward to seeing how the market reacts to this, and I will update this page as things evolve! 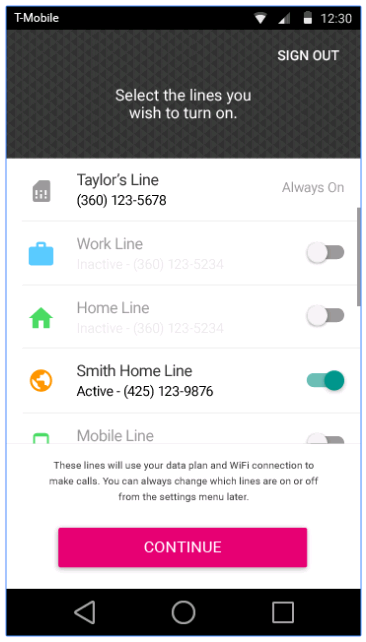 I also think this is a great feature for prepaid wireless customers! You can find their site at T-Mobile Digits.